If you’re new to power tools, but want to get yourself an angle grinder for your next DIY projects, then you should probably consider buying a couple of grinding discs as well. While the angle grinder is a versatile tool itself, the discs are what make it one of the most, if not the most versatile power tools altogether. The reason being, is because the angle grinder is nothing without a quality cutting disc. The disc is what determines what the angle grinder can, and cannot cut. With that being said, there are a few things to consider when buying an angle grinder disc. The reason being, is because there are safety and health concerns to be aware of. Cutting or grinding with a disc that isn’t capable of doing so on a specific metal can lead to serious injury. Ensuring the right wheel is installed into your grinder will ensure your workplace is safe. The first step to buying an angle grinder disc is to check its speed rating. The speed of the grinder shouldn’t be higher than the maximum speed of the disc. The speed is measured in RPM (revolutions per minute), and running the disc above its maximum RPM can be dangerous as it can lead to the disc breaking or exploding. The physical size of the wheel is as important as its speed. 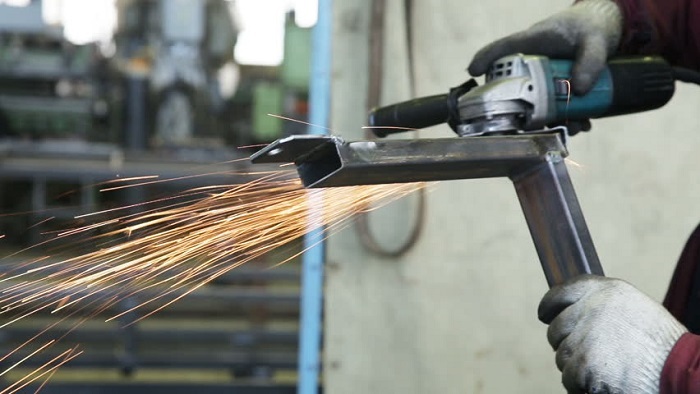 A smaller wheel will fit on a larger angle grinder, however, that will impact the peripheral speed, so it’s not really something you should do. Furthermore, the abrasive the wheel is covered in will impact its strength and it will determine what type of materials the wheel can cut through. Next, consider the grit size. This is determined by the task you’re working on. If you want a lot of material removed, then a coarse grit is ideal. On the other hand, a fine finishing task requires a finer grit. Coarse grit sizes are typically 24g, while finer grits are about 100g. When the product gets shipped to your home, do a thorough examination for any signs of damage that may have occurred during transport. If you spot or hear any damage, do not use the wheel and return it to the supplier. If there’s no damage, then you should store it properly in an area that isn’t susceptible to tear or rooms where there are significant changes in the temperature, as that can damage the wheels’ bond.